"I knew I had an advantage with the aerodynamics into the head wind but you still don't know how your going to come back into the last ten kilometres if your going to absolutely blow." 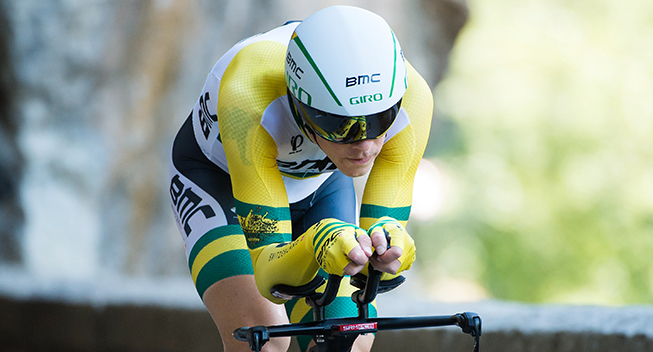 Rohan Dennis (SA) completed a day of back-to-back victories as he flew to the elite men's time trial title at the 2017 MARS Cycling Australia Road National Championships in Buninyong. Defending champion Dennis was the final rider to roll down the start ramp before heading out on the undulating course through Golden Plains shire. A disciplined start saw former winner Luke Durbridge (WA) three seconds faster at the half way point creating an exciting second half of the race. With the win in his grasp Dennis powered home to claim victory in a time of 50minutes and 59.27 seconds, beating his 2016 winning time by over 20 seconds. Durbridge, held on for second in 51 minutes 57.52 seconds after slowing in the second half of the race. While Ben Dyball (NSW-52:37.99) claimed bronze in his fourth top 10 finish in a row. "I was a little bit nervous about today. Things haven't been going well for me the last week. Some things have come unstuck," said two-time Olympian Dennis. "It was a little bit unknown of how I was going to go today. At the halfway point I was pretty stressed with Durbridge actually three seconds up on me. "I knew I had an advantage with the aerodynamics into the head wind but you still don't know how your going to come back into the last ten kilometres if your going to absolutely blow. I sort of did to be honest but I was lucky everyone else did the same." "Maybe I should just have bad luck before the race and I wouldn't have it in the race. Obviously last year didn’t go to plan with luck but you have those years and you just have to take the good out of it and go ok, keep preparing like I did. "I've been lying to myself and a few others. Probably about five or six days ago I woke up at midnight and had a really sore throat and I've just been on antibiotics since," Dennis revealed of his interrupted preparation with illness. "I've kept it quiet and been telling myself it was severe hay fever but last night I had my sinuses and everything all blocked up. I was stressing a little bit."